I have been intrigued by the history and symbolism behind jewelry for even longer than I have been making it. Rings in particular are loaded with significance. Since ancient Egypt rings have been know to be the most intimate pieces that we wear. Throughout history rings were used as personal talismans, in business transactions, as symbols of status, and of course to pledge your love to another. The story of the wedding ring does not have one clear path; it changes with each religion and country's view of marriage. Some rings strictly marked the legal contract of marriage, while others were clearly crafted in the name of true love. But this shift isn’t chronological like we might expect, instead it ebbs and flows in different times and different places. This is a topic I have been reading about for years and I wanted to share the story as I know it. Almost 5000 years ago, ancient Egypt was the first known culture where people would exchange "rings of love" often made of woven reeds or leather. It is said that the Egyptians saw the ring, a circle, as a powerful symbol. The band with no end representing eternal life and love, and its opening representing a gateway to worlds unknown. Rings were highly regarded in their culture, especially scarabs and signets. Signet rings, used as a personal signature, continued to be used by the Greeks and Romans. It is said that the signet inspired some of the earliest known betrothal rings in Rome. Yes, in Egypt they exchanged rings as gifts of devotion, then in Greece they gave rings to lovers featuring Eros the god of love or his cherubs. But it is believed that it was the Romans who linked the ring to marriage. 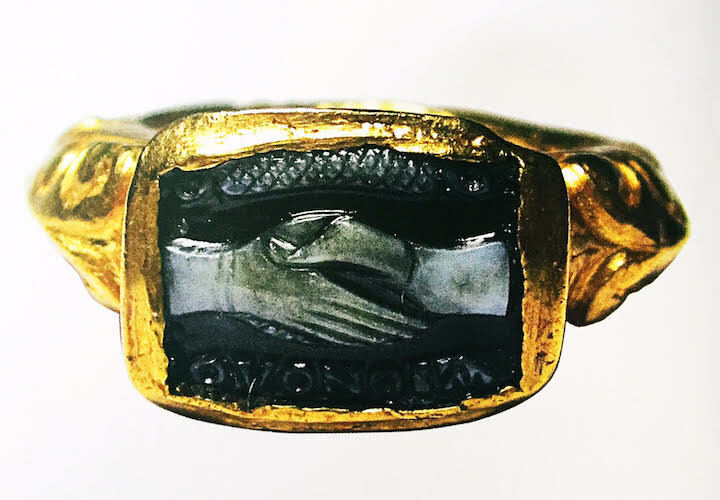 Most commonly with a "fede" ring, depicting two hands clasping in love or agreement/ dextrarum iunctio. These designs could be made in solid gold or carved in stone, like a signet, often in cornelian, aquamarine, garnet, or onyx. As time went on the Romans began personalizing wedding rings, shifting from the fede to carvings of the couples themselves. This carried over to the Byzantine Empire in the Middle Ages when most rings were carved with the faces or full figure of the betrothed couple. Once Christianity became the Empire's official religion the couple was often depicted with Jesus or a cross between them, blessing their marriage. Fede rings, in different styles, were popular in Europe for over a thousand years. They resurfaced in the 1100s and lasted for centuries. Over the years they became much more intricate with interlocking bands (see gimmle rings below) and ornate enameling. Most commonly still worn today is the Irish Claddagh ring, two hands holding a heart with a crown. The Claddagh ring was first designed in the 16th century, thirteen centuries after the original fede rings of Rome. Today many couples who make their rings in my workshop want to make sure that their rings are full of meaning, and wonder if they should have “more than just a plain band.” But in knowing the history of the simple band you can see that it already is rich with its own significance. Sometimes less really does say more. The gimmel ring, like a small puzzle, was popular in the 15th through the 17th century. While posy rings became simpler over time, gimmel rings became more intricate and complex as goldsmithing techniques advanced. Gimmel rings consist of 2-3 interlocking bands, wonderfully symbolic in that each band is free yet must remain together to create the whole. With early gimmel rings, the bride and groom would each wear a band leading up to the wedding day when they would be put together to symbolize the joining of two people. Many gimmel rings housed beautiful cut stones and ornate carved features highlighted with colorful enamel. Some of the common symbols in gimmel rings were the fede hands, forget-me-not flowers, and red hearts. Later designs also included a touch of memento mori, featuring a skeleton and a baby, symbolizing life and death, and eternal love beyond this life. It is a long standing Jewish tradition that the wedding band must be an unbroken circle of solid gold or silver representing an everlasting marriage. With no stones or details representing a marriage free of distraction or complication. The minimum value is said to be a penny (pe’rutah) this low value represents that their intentions are true and not driven by money or false pretense. The lesser known is the past tradition of the Jewish ceremonial marriage ring. Dating back at least to the 10th century and used through the 19th century, becoming more intricate over time with filigree and enamel. Often the roof, thought to represent the couples' home or temple, opened like a locket to reveal a Hebrew inscription. Since these rings were so ornate they were most likely shared for all of the weddings within a town. There are many different opinions on the meaning and purpose behind these ornate rings that grooms offered their bride during the ceremony, unfortunately there is very little documentation preserved about these rings. Illustration from Costanzo Sforza and Camilla D'Aragona's wedding depicting the diamond ring holding up the two burning torches. Today many people know De Beers’ to be behind the diamond ring, while it is true that they popularized it as an engagement ring, diamonds had indeed already been used in love rings for several centuries. The first known diamond ring was actually from the late 100sAD found in Rome, an uncut diamond ring belonging to a young girl. However there is no way to know it if was a gift of love, a symbol of status or any other type of ring. Early on it was known that diamonds were strong and considered valuable, but it wasn't until many centuries later that they had the tools to cut them and reveal their sparkle. In the 15th century a gift of jewelry was often sent from the father of the bride to father of the groom, proposing the intent to marry off his daughter. It was not uncommon for this gift to be a diamond ring, in a way, marking the beginning of the diamond engagement ring. By the 17th century diamonds were showing up more often in wedding and engagement rings. At this time the diamond could be given from the man to woman or woman to man as a pledge of love. In the Georgian era of the 18th century when simple posy rings were still widely used as wedding bands it became popular for women to wear 'keeper' rings on either side of her wedding band to accent and protect it. These rings were commonly made of rose cut diamonds set in silver and gold, similar to today's eternity band. Diamond engagement rings grew in popularity over the 19th century, but did not become the norm until De Beers' launched their "Diamond is Forever" campagne (by Frances Gerety) in the mid 1940's. Today a diamond engagement ring is still the most common choice, however many couples now opt for unique styles, vintage pieces, rough diamonds, or non traditional stones. Other couples are interested in more eco friendly options including lab grown diamonds and moissanites, or recycled diamonds. Some women decide to forgo the engagement ring all together, while some men now choose to wear engagement rings along with their partners. Historically this is such an interesting time since people have started creating their own traditions. Throughout history while the ideas of marriage changed along with the styles of the rings that represented it, the ring finger also changed. Weddings rings have been documented to be worn on every finger, even the thumb. Today it is most commonly worn on the forth finger of the left hand, but some countries and cultures do it differently. Most notably moving the engagement ring to the right hand after the wedding or the reverse. But how did the forth finger become known as the ring finger? Well that goes back to the Egyptians again (...or early Romans depending on who you ask.) They are said to have believed that the forth finger had a vein or nerve that connected directly to the heart. And while there is not a bit of scientific evidence to support it, we returned to that tradition out of pure sentiment. Which might just be my favorite part of the wedding ring's story.